Are you having problems with child and family turnover? At our Child Care Success Summit a few weeks ago, industry expert Dennis Vickers spoke to the crowd and cited this statistic: 50% of child and family turnover happens within the first 60-90 days after enrollment. That means HALF of the families that leave your center do so soon after enrolling. 1. Create a powerful demonstration by installing a flat panel TV screen in your lobby and playing photos and videos of children participating in the previous week’s classroom activities. When families come in for a tour they will be captivated by this and will see the fun things that are happening in your classrooms. Learn more about other ways to use videos in your marketing here. This demonstration also serves to remind your existing parents and staff of the fun that is taking place in your center. This is a wonderful way to establish your school as a high quality, fun, and caring environment the moment someone walks through your doors. 2. Another great demonstration is a one page flyer or marketing piece that lists the names of your teachers, their education, the number of years of experience in early childhood education they have, how long they have been working for you, and a short testimonial or interesting personal fact about them. You can include this sheet in your prospect packet and hand this information to your families during the tour. When you have a piece of paper that highlights why your teachers are wonderful it is powerful and will increase your credibility in the minds of your prospects. Post this demonstration on your website as well, so that families searching online for child care will see how amazing the teachers are at your school. 3. You should also make it a priority to market the characteristics of your program that are special and unique. You can do this by creating demonstrations highlighting these qualities. For example my very first client, the TLC Academy in Hudson, Ohio, wanted to advertise that they had much lower child to teacher ratios than the state requirements. We created a table illustrating TLC’s ratios compared to those of the state, provided it to potential clients, and posted it online. They still use it today and it is located on their website under “Unique Benefits”. Visually demonstrating that you have a 1:3 ratio in your infant room compared to the state’s 1:6 is very compelling and not only sets you apart from your competition with numbers but also illustrates the unique philosophy of your program. I hope these tips will help you brainstorm some different ways to incorporate powerful visual demonstrations into the marketing materials for your school! Do you know what the Zero Moment of Truth is and why it is changing how and when you market? Devin discussed this major change at last years Child Care Success Summit is Atlanta, GA. 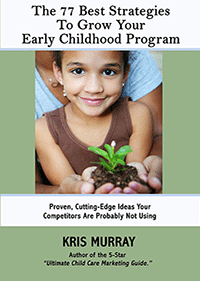 If you want to continue to have a full early childhood education program, or want to fill the program you already have you need to start educating your prospects earlier than ever before. Credibility is key to growing your enrollment and being able to charge more. You must take the time to grow the trust your customers and prospects have in you. As child care owners and directors, many of you understandably have never been trained in creating effective marketing materials, including brochures. So I’d like to share with you the three “must-haves” you need to make your child care brochure stand out and work harder for you. First of all, your brochure should focus on communicating how your program is unique and different from most (or all) of the other programs in your area. Let your brochure provide prospects with specific unique benefits that speak to how you transform the lives of children and families. Ideally, you have identified 4-6 concrete, specific differences in a bulleted point list. Put those front and center in your child care brochure. Second, you need social proof to back up what you say. Did you know that testimonials and reviews from parents are more than 20 times more powerful and credible than what you say about your program? Let the “voice of your customers” work wonders for your business and enrollment. Ideally, your brochure will include two or three detailed parent testimonials or five-star reviews. People are now conditioned to look for 5-star reviews of local businesses, so if you can frame your brochure content to include these, all the better. “Best of” awards from the local community and/or experts are also incredibly valuable and you should include these in your child care brochures. So you might be wondering: how many brochures should I print? I recommend enough to get you through a 3-4 month supply needed for tours and special events in the community. This way, you can change up your brochures with new features or new call-to-action offers, and keep your brochure fresh and up to date. Your Assignment: Pull out your brochure now and “grade” it based on how it meets the above three must-haves. Use these ideas to improve your brochure, or give it a total re-vamp. Good luck, and let me know your results! 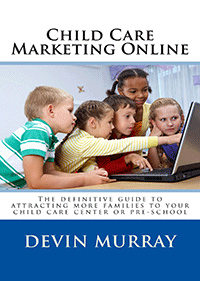 Do you use numbers in your marketing messages at your child care? Using numbers such as the amount of families you have served, or the number of years of experience your teachers have, will help create trust with your prospects and give a sense of longevity in the child care market. 3,127 families served since 1986. Would this engender trust? Yes. It paints a picture of how long you’ve been in the child care business, how well your child care business is run, how knowledgeable you are about the field, and all the families you’ve helped over the years. We have a combined teacher experience of 323 years. When you use numbers in your marketing, it’s powerful. People remember numbers, odd numbers in particular. Saying something like 3,000 families served since 1986 sounds less authentic than the actual (or estimated) number, so don’t round it off. These numbers should be in your marketing key points. The message can be on your website, your brochures, and headlines in your advertising. It is a simple, easy way to demonstrate knowledgeability and create trust. #60 – Was Your Direct Mail Campaign Successful? Do you use direct mail to market your child care? Do you know how to tell if the campaign has been successful? 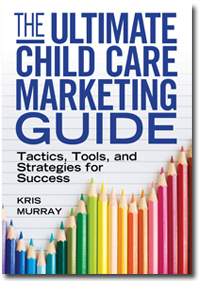 Do you have a way to compare it to other marketing campaigns you’re using for your child care? If not, then you are wasting your marketing dollars. Direct mail can be a powerful way to grab the attention of prospects for your child care that you aren’t able to reach any other way. I’ve seen great success from my child care coaching clients who take a highly targeted, multi-step direct mail approach. First, you can target the lists for your direct mail campaigns and find 500 to 1000 of the best families that match the demographics of the ideal clients for your child care. Then send multiple pieces in a time frame of two to three weeks to this list. I do this when I promote my Child Care Success Summit training conference. I usually narrow down my list to my best clients, and then send this targeted list a succession of mailings to get them to take action. When you send out a couple mailings in a multi-step campaign, you want to send follow-up mailings, saying something like, “I didn’t hear from you the first time…..” This will typically double the response rate, so it really can be worth your while. Including some sort of lumpy mail or 3D mail is also a great way to get the attention of the prospects for your child care and can boost your success in enrollments. Pinterest is a great social network to reach prospects for your child care and the company has just announced that they are rolling out promoted pins. This platform just happens to be one big social media where all the Moms are hanging out. So let’s dig in and talk about a new way to reach the prospects out there that could be your next enrollment. The ads show up on the web and in mobile and the majority of the parents you want to reach are on mobile.The promoted pins can be CPM (cost per thousand impressions) or CPC (cost per click), similar to any Google campaign you might be running. Clueless about Pinterest? It’s simply a website offering an image based way to “scrapbook” photos, videos, products, and objects to a relevant digital board and share these with friends. It is a powerful, growing vehicle. Many users generally interact with products by pinning items they want to buy and collecting information about services they are interested in. If you want to learn more about how to use Pintrest to market your child care I can show you how. So give promoted Pinterest posts a try and make sure to experiment with different pins to see what gives you the best results! This week I wanted to tell you about a strategy I teach that will help you to find the best clients for your child care. It’s called “Map It Out.”This method recently came back to my attention as I saw it produce great results for Kristen, one of the Gold Core Members from my Child Care Success Academy. I teach this strategy in my book, but I don’t see very many people take the time to go through the process, so I wanted to give you some inspiration with an actual case study to show you that it works and it’s worth it! The underlying principle of “Map It Out” is to gain clarity on where your best customers live in order to find the neighborhoods to better invest your marketing efforts. This will help you to gain even more of, what I call, the A and B clients. You can map it out in three easy steps – identify your best clients, map out where they live, and then determine the best neighborhoods that provide you with these clients. The first step is to print out your roster and identify who your best clients are. These are the folks that refer other people to you, give you great testimonials, pay on time, and are generally wonderful to work with. These people are your A and B clients and you want to have a clear picture of who they are. Physically print out your roster and highlight all the A and B customers. The next step is to look at the addresses of your best clients on a physical list and map them out. You can either manually put pushpins or markings onto a map, or, even easier, export them into an Excel spreadsheet and use geomapping online to map out the addresses for you. One very easy site to use that will save you a lot of time is http://batchgeo.com/. You just copy and paste in an Excel spreadsheet and they will create a map for you with pushpins of your client’s locations in just a few seconds. Determine what your best neighborhoods are by where your best clients are clustered. This will give you a better understanding of who your clients are, where they live, what they want, and where they work. Even if you think you know where people may be coming from already don’t skip this strategy. You may be surprised by the results! After going through this process my client, Kristen, said to me on a coaching call, “I really thought when I did this it would be a spread across the different neighborhoods but it wasn’t, it was in two core pocket neighborhoods.” So she really pinpointed where her best clients live and work by doing this exercise and now knows exactly how and where to market. Action Step: So take a little bit of time this week to map it out and gain clarity to determine what your best neighborhoods are. You can then include in your marketing plan to go after the families in those pockets. You can work with homeowner associations, create door hangers, create direct mailing campaigns, and even more. You can include a great message such as, “Your neighbors are coming to my school and I’d love for you to come too.” Give them an offer and a reason to take action and see even more great clients enroll!